In February 1898, the USS Maine was anchored in Cuba’s Havana Harbor. Cuba was struggling for independence from Spain. If the struggle turned into war, the United States wanted to be ready to protect its interests. On a hot and humid night, the ship’s bugler blew taps. An image of the front page of the New York Journal, February 17, 1898. At 9:40 p.m., there was a huge explosion. Anything not batten down, was flung into the air. The USS Maine quickly sank to the bottom of the Havana — and 261 men along with it. The cause of the sinking remained unclear. Popular opinion in the U.S. blamed Spain, due to the inflammatory articles printed in the press. William Randolph Hearst and Joseph Pulitzer were competing for readers. Hearst had recently acquired the New York Morning Journal. His chief rival was the New York World, published by Joseph Pulitzer. Hearst and Pulitzer were going head-to-head to sell newspapers. The more outrageous the story, the more newspapers they sold. 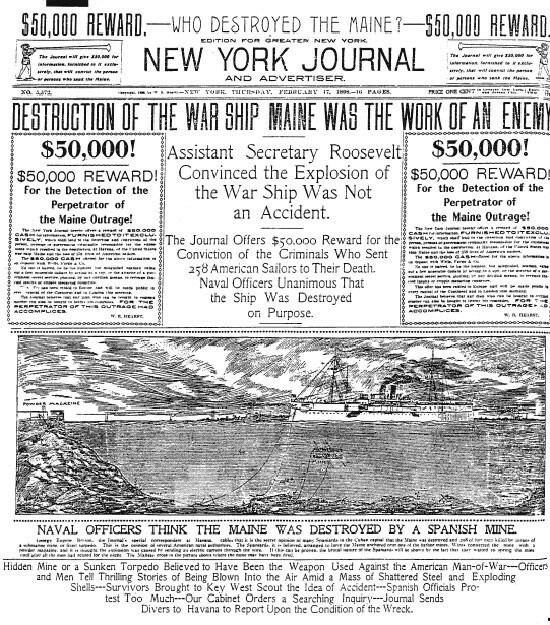 Both newspapers gave intense coverage to the USS Maine. They exaggerated and distorted information about Spanish atrocities in Cuba. The public whipped itself into a frenzy! Two months later, on April 21, the U.S. declared war on Spain. The events of the late 19th century sound too familiar in comparison to the 21st century. Today, we have a different name for yellow journalism: fake news, or disinformation. Disinformation has taken on a life of its own. It’s written content that’s published online and in print with the intention of misleading the public. It’s used to damage a particular person or organization. And it’s used to get more views and clicks — to make the story go viral. Last year, a 19-year-old named Nikolas Cruz took an Uber to Marjory Stoneman Douglas High School, his former school in Parkland, Florida. He had an AR-15 rifle. Cruz got out of the car and started shooting — he killed 17 people. The police took him into custody and released his name to the media. Soon after, there were tweets about Cruz being an undocumented Deferred Action for Childhood Arrivals (DACA) recipient, commonly known as a Dreamer. DACA recipients are children brought to the U.S. by undocumented immigrant parents. Social media claimed that Cruz was a Dreamer. But other than his last name being “Cruz,” there was no evidence that he was a DACA recipient. Disinformation is dangerous. When public opinion is shaped by lies and fake news, we all lose. However, artificial intelligence (AI) can provide a solution. The solution is an algorithm called AdVerif.ai. It was developed by a startup with the same name. It scans content to look for any obvious signs of false information. To know more about the algorithm, click on my YouTube video below, where I talk more about it and this AI mega trend that I follow. This algorithm will be beneficial for businesses because it will call out fake claims about their products. It will also make sure that the content we read on the web is true. This will be a constant battle — one that will be left to AI to help us in getting information and news that are factual. If you don’t have exposure to AI in your portfolio, now is the time to get some. AI is a mega trend that will change how we live and act. And it will have a trillion-dollar impact on the economy. One way to invest is to buy an exchange-traded fund (ETF) such as Global X Robotics & Artificial Intelligence Thematic ETF (Nasdaq: BOTZ). BOTZ holds a portfolio of around 30 companies that have exposure to robotics and AI. Just since the start of 2019, the ETF is up roughly 18%, while the S&P 500 Index has gained less than 12%. On January 24, I also recommended Robo Global Robotics & Automation Index ETF (NYSE: ROBO) to take advantage of the AI revolution. Since then, the ETF has jumped more than 11%, doubling the broad market’s gain of only 5% over the same time period. Stay tuned for more opportunities! I’ll recommend great stocks in tech and other sectors in my newsletter. More on that in the coming weeks. P.S. Don’t forget to subscribe to my YouTube channel. Just click here and hit the subscribe button to be notified when I upload a new video!